Do you need some good reasons to tick Israel off your bucket list in the near future? Other travellers who have already been there will surely tell you that it is a technological capital with a vibrant social life and beaches of unparalleled beauty, but actually the main aim of those currently searching for flights to Tel Aviv is to attend the Eurovision Song Contest 2019, of which it will be host city. As a tourist, the safest and best area to stay in Tel Aviv is the beach strip spanning several kilometres along the coast and located less than 20 kilometres from Ben Gurion International airport. In fact, the majority of hotels are concentrated on this part of the city, locally known as the Tayelet, and you can choose among luxury establishments belonging to worldwide-renowned chains and others owned by Israeli hospitality companies. If you are looking for an urban escape combined with all the perks of the beach life, perhaps the greatest advantages of staying here will be waking up to sea views and being within short walking distance of the seashore. Nevertheless, the Tayelet equally offers easy commutes to the main attractions and landmarks while ensuring that you will be in one of the most exclusive parts of town. Read below to find out more about our recommended hotels in Tel Aviv. 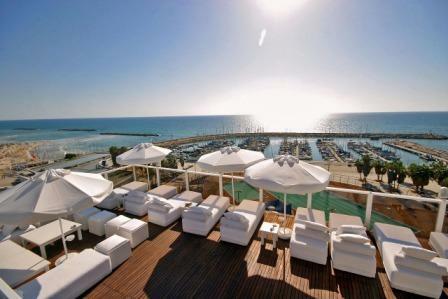 Right next to the beach promenade, few metres from the Gordon, Frishman and Bograshov beaches and within short walking distance to the Tel Aviv Marina, the Prima hotel features beautiful sea views from its onsite restaurant and panoramic views of the entire area from some of its deluxe rooms. The units, which may accommodate solo travellers, couples or families travelling with kids, are arranged differently including single or twin beds, extra large double ones and even complementary sofas that can be converted into full-sized beds. Besides, guests enjoy in-room amenities such as satellite television channels, free WiFi and private bathroom with shower. The staff at the reception of this hotel in Tel Aviv -Israel– will gladly provide you with access to extras like bikes to get around, safety deposit boxes to use, admission to the sun terrace and tickets to attractions and tours, and assist you with any specific dietary requests you may have for your meals. This 5-star hospitality establishment offers airport transfers for a surcharge. Its exceptional location on the beachfront guarantees the most breathtaking Mediterranean views, especially the ones you will get from its rooftop swimming pool. All the well-appointed rooms and suites of this luxury hotel in Tel Aviv feature complimentary WiFi, en suite bathroom, cosy beds and amenities, and can be of single, double, triple or family occupancy. If you really want to disconnect and immerse yourself in this new destination, this is a great opportunity to indulge in their spa treatments, the traditional food served on site and the local businesses around. Hilton Beach and the Tel Aviv Museum of Art are just a stroll away. Also on the beachfront and part of the Leonardo Hotels hospitality chain, this 5-star establishment gives you a unique chance to combine business and leisure while in Israel. The Herzliya Marina, which gives it its name, is actually a small island strategically situated close to the main shopping sites and some renowned scuba diving centres. Confirmed guests get to enjoy a daily complimentary breakfast that may be included in the nightly rate, and their rooms are equipped with mini bar, cable TV, air conditioning, private bathroom, bathrobes and slippers. Furthermore, there are many other facilities and services they will be entitled to use during their stay at this hotel in Tel Aviv, among which we count an onsite fitness centre, a garden, an outdoor pool, a bar, a restaurant serving local specialties and a spa.